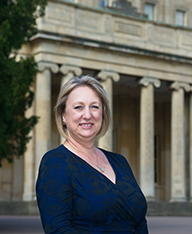 Amanda Strange is the new licensee of The HR Dept Cheltenham and Stroud. We caught up with her to find out how she got into HR, share some of her experiences and tell us how she’s getting on in her first few weeks at The HR Dept. When I left school at 17, I went to work for the Magistrates’ Courts in an admin role. I stayed there for 17 years. For most of that time I was the PA to the Justices’ Clerk. Back then we didn’t have an ‘HR’ department as such. But I was responsible for keeping the personnel files and also recruiting magistrates and organising training. You could say I’d started working in HR but not realised it at that point! What inspired you to go “full HR”? After the courts I decided to leave for a completely different sector – a large commercial outsourcing company. I joined as the PA to the MD and as HR administrator. There was a regional HR manager in place. I saw what she was doing and thought I would like to do that. I liked the idea of driving around to different client sites, supporting managers with issues and helping them to solve their people problems. I liked the thought of being the “expert”. An opportunity arose for me to take on a regional role and the company invested in my development and supported me with gaining my CIPD qualification. It was the best thing I could have done in terms of changing my career direction. It was challenging as it was a fast-paced business. I was learning on the go, but the type of business it was gave me a wide variety of issues to deal with. This was great for my learning and general experience. How have you found being a licensee for The HR Dept so far? At the time of writing I’ve almost completed my second month. So far I’m really enjoying it. I feel like I’m starting to become part of the SME community in my territory and the support I’ve had from the central team has been amazing. I’m looking forward to signing up my first client!